The photo below shows the dye penetrant test for Monel 400 pipe elbows supplied to a client from Peru. The elbows are manufactured to ASME B16.9 and ASTM B366 WPNC (UNS N04400). The liquid penetrant examination (LPE) shall be conducted in conformance with ASTM E165. 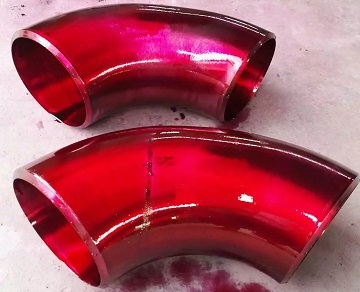 Liquid penetrant examination for Monel 400 elbows, 4″ & 3″ L/R SCH40.